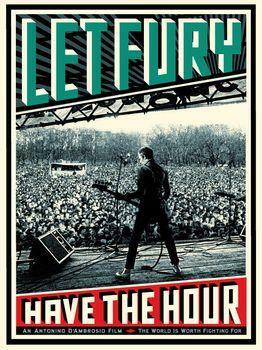 Shepard recently created some poster/print artwork for a soon to be released documentary on the Clash that coincided with the Let Fury Have a Heartbeat exhibition at Subliminal Projects, on now. The print will be released on Thursday, Jan 7th at Random. Its signed by both Shepard and author/director Antonino D’Ambrosio. Edition of 450, S/N, $50. Limit 1 Per Person/Household. VIEW THE LET FURY HAVE THE HOUR TRAILER VIEW SUBLIMINAL PROJECTS LET FURY OPENING RECEPTION VIDEO Based on Antonino D’Ambrosio’s critically acclaimed book, the documentary Let Fury Have the Hour considers a range of increasingly pressing concerns, using the Clash’s legacy and, more importantly, the profound creative-activism of artists, musicians, and citizens throughout the world as a framework to address persistent issues—from poverty and racism to environmental devastation and war. The film offers insight from people who believe in the power of art and culture to tackle these issues, and who promote a worldview that is inclusive, expansive, and dynamic. Like the Clash and featured creative-activists, the film challenges its audience to make a difference, creates a new dialogue that moves beyond reactionary and simplistic politics, and inspires us to become part of a historical process of justice and change.